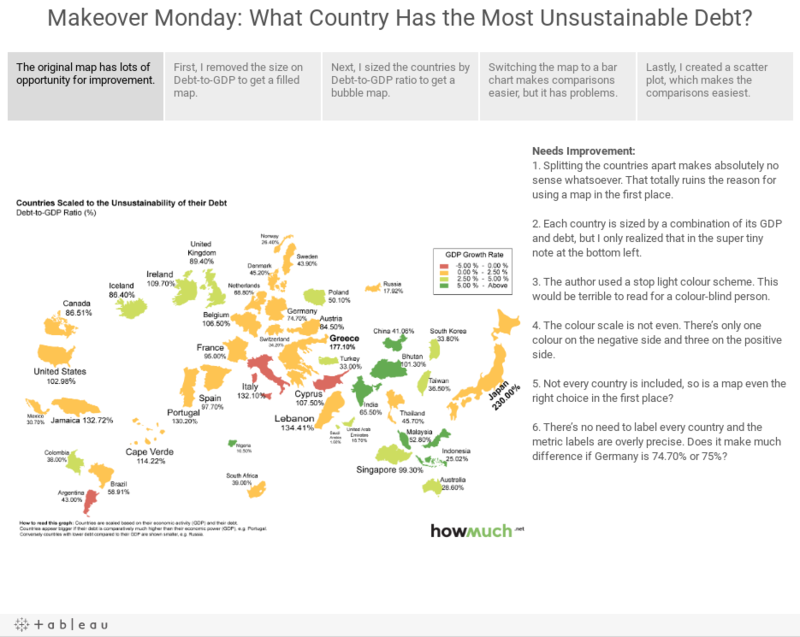 Makeover Monday: What Country Has the Most Unsustainable Debt? Splitting the countries apart makes absolutely no sense whatsoever. That totally ruins the reason for using a map in the first place. To Do: Put the map back together and let the map serve its purpose. 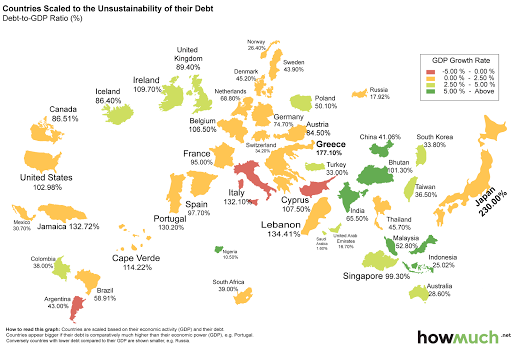 Each country is sized by a combination of its GDP and debt, but I only realized that in the super tiny note at the bottom left. 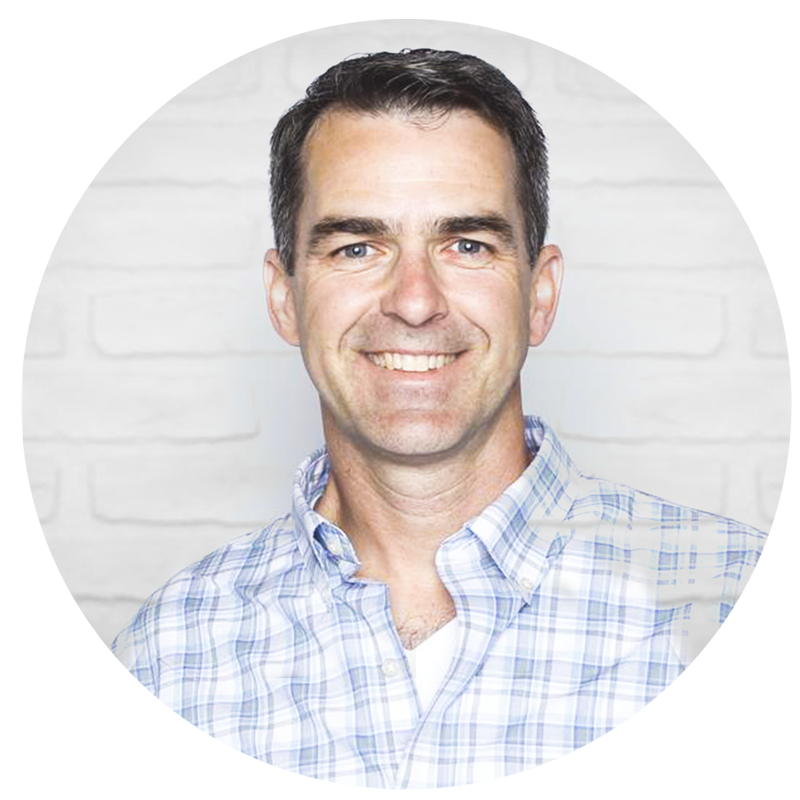 To Do: Make the sizing more obvious and easier to understand. The author used a stop light colour scheme. This would be terrible to read for a colour-blind person. To Do: Change the colour scale to something more effective that appeals to everyone. The colour scale is not even. There’s only one colour on the negative side and three on the positive side. To Do: Make the ranges equivalent. Not every country is included, so is a map even the right choice in the first place? To Do: Consider alternative charts, e.g., bars. There’s no need to label every country and the metric labels are overly precise. Does it make much difference if Germany is 74.70% or 75%? To Do: Clean up the clutter. 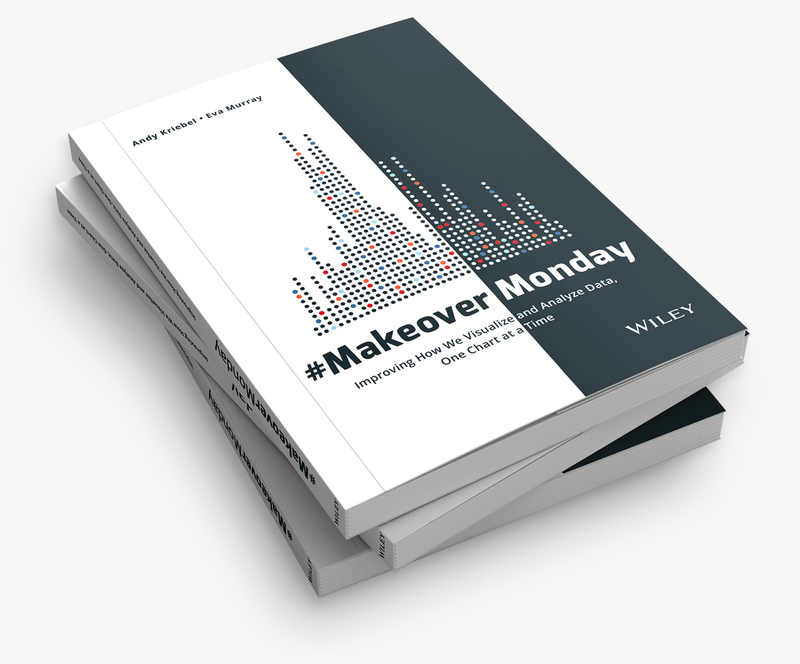 Given the above challenges, I’ve used Tableau story points to walk you through the makeover. In the story, I take you through a series of visualisations that gradually improve the original. 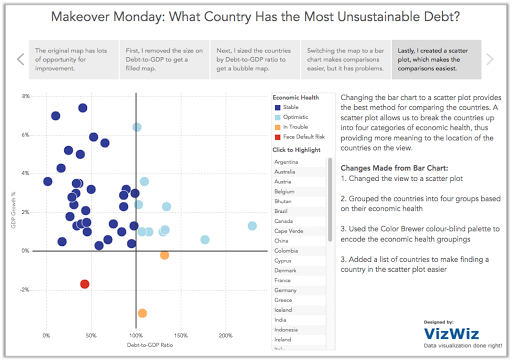 * Loss of labels makes the Viz harder to use, because you have to either hover or select a country. I added labels, so you easily identify the outliers. * Using position _and_ color to indicate quadrant is redundant. I used color to bring geography back, so you can look at interesting clusters like Europe. * I labelled the quadrants so you don't have to refer to a color legend to understand the 4 quadrants. * I toned down the grid lines for legibility. Great additions Steve! I really like what you've done. Thanks for sharing and showing me how I could've made it even better.